Nefyn is dramatically located on the cliff tops at the foot of the Porthdinllaen headland, a tiny promontory that juts out from the Lleyn Peninsula into the Irish Sea. In terms of sheer topographical exhilaration, Nefyn is Wales’ equivalent of Ireland’s Old Head of Kinsale. This is literally golf on the edge of the world. Nefyn and District Golf Club was founded in 1907, originally as a nine-hole course and in 1912, it was extended to 18 holes. One of the great triumvirate, J.H.Taylor, was commissioned in 1933 to add a further nine and to revise the existing course. F.W. Hawtree and his his partner A.H.F. Jiggens, known as “Jigg,” built three new holes in the 1980s. Until recently, the layout at Nefyn was extremely unusual with 26 holes in play. The course comprised of 10 outward holes and two separate inward 8 holes, these two 18-hole courses were named the Old and the New. This rather strange configuration made life somewhat confusing for the first time visitor. However, Swan Golf Designs has rung the changes after a lengthy five-year advisory period whereby numerous improvements have been made, the most significant of which was the creation of new holes on the dramatic “Point”. Today there are three distinct 9-hole loops at Nefyn, named Front (holes 1-9), Old (holes 10-18) and New (19-27). The Old course combines the Front and Old nines to create the club’s premier configuration. Most visitors will elect to play the Old course because it’s the Point’s spectacular cliff edge holes that are at times quirky but frequently jaw-dropping which simply have to experienced. There are only a few seaside courses where you can see the sea from every hole, but you sure can at Nefyn. Not only is the sea in view, but also on a clear day, you can spot peaks of the Wicklow Mountains across the Irish Sea. The opening hole takes you away from the clubhouse to a series of cliff-top holes on the edge of the headland. There are blind drives, strategically placed bunkers, thick rough and, of course, the ever-present wind to contend with. The Old course back nine plays along the Point peninsular, providing spectacular views across the cliffs and the bay. After the par four 15th, you’ll find a footpath down to the Ty Coch Inn, located on the beach at Porthdinllaen. A quick drink here on the pub’s famous wall, with the soothing sound of the sea and the glorious view across the bay to Mt. Snowdon, will set you up nicely for the closing three holes. We played the front and new loops on Saturday and I thought the course was superb and the best I have played in the UK (including open championship courses). The only thing that let it down was the facilities - it was a Saturday and one of the hottest days of the year. The course was busy and every tee time had been booked that day, yet the half way house was locked up and the drinking water tap outside it had obviously not worked for some time. If one were putting together a listing of courses that should be on a clear makeover listing then the primary candidate from Wales and most likely the UK is Nefyn & District Golf Club. The location of the course is utterly brilliant stuff -- the issue is that with very few exceptions the holes are either lame or positively baffling. Top tier design rests fundamentally on much more than a superb site -- it's mixing in the details that take things to a much higher level. The opening three holes get the juices flowing. I really liked the opening hole. You tee off towards the Irish Sea and the blind dimension of the hole is grand stuff indeed. The 2nd and 3rd holes hug near enough to the water and are both fine holes. Just when the juices are flowing the course does a dead stop. The holes become a continuous progression of sameness and lacking any imaginative creations. The greensites are the primary culprits -- they are vapid and offer no meaningful contribution. Some have opined that Nefyn is the Welsh equivalent of Old Head. That's a major stretch simply because Nefyn doesn't have at least six world-class holes as the Irish layout possesses. Much has been made of the par-4 4th on the Old side. The tee shot is certainly a fun stroke to make but there's nothing else present -- save for the view which is clearly glorious when the weather cooperates. The only sure thing one can say for certain is that a visit to the Ty Coch Inn is a must and doesn't disappoint for the local flavor it clearly provides. Nefyn doesn't need course surgery to the extent that the intent of what a James Braid and J.H. Taylor layout can provide. It would take an astute present day architect to rein in their inner desires to "modernize" the layout. But, Nefyn would gain immeasurably from a makeover that would add a rich slew of design details. The potential with the site is there. The property could produce not only the finest of courses in Wales but also a real contender for world recognition. But the word "if" is small in size but looms large if ever the application is pursued here. I think this is a little harsh, but a lot of the fun was lost with recent safety driven changes that have made the peninsula holes frankly a bit of a mess. I would question whether visitor numbers or budget would sustain the required investments. Nefyn & District, Wales’ answer to Ireland’s Old Head. Unbelievable beauty in places, more than a little bizarre in others. There are three sets of 9 at Nefyn; the Front, the New and the Old, also known as the Point. It’s the Front and the Old that make up the 18 that draws in the visitors as these are the holes where the scenery is at its most spectacular. The front gets off to a wonderful start with a drive into the horizon before a heavily sloping fairway half way along the hole takes you down to a green set beautifully in front of the Irish Sea. There’s then even a hint of Pebble Beach about the 2nd as the hole hugs the clifftop, curving to the right, similar to the 6th at Pebble. 3 and 4 also follow the top of the cliff before the short 5th with the medal tee perched precariously over the cliff being the first hole that takes you back inland. The holes calm down for this remaining stretch on the front 9 and provide a fair test but nothing particularly noteworthy. After finishing the Front 9, take care not to play from the adjacent 10th tee as you then need to head on quite a long trek back to the clubhouse to play the Old 9. I know that this 9 is the reason people come to Nefyn but having now played it just once, I’m not 100% sure what to make of it. James Braid is my favourite golf architect and JH Taylor designed my home course at Hindhead so it should have been a match made in heaven, but if I’m honest, I think they got a little over excited trying to create a masterpiece. I’ll start with the 1st/10th hole which I find more than a little contrived. It’s easy to run out of room with the tee shot and there’s no marker post available for which to aim your approach shot despite the pitch to the green being completely blind from the fairway, so I did all you can do and hit and hope. What I then understand to previously have been quite a dangerous par 4 has now been turned into two par 3s. The former is quite an ordinary short hole whilst the new 3rd/12th “Ty Coch” is one that I really enjoyed. You make a strangely long walk across some of the closing holes to get there, so the routing is far from adequate, but the hole is a delight, played across a ravine with a 140 yard carry to the putting surface. 12 and 13 both in fact have shades of Turnberry. The 4th/13th is the signature hole which takes you to the edge of the peninsula, and again, it was a hole that I personally loved. You bite off as much as you can chew as you carry your drive across the cliffs in this classic risk and reward par 4. The approach to the green is then a little funky, but I’ll give that a free pass simply for the quality of the tee shot. I’m then a little perplexed about the next hole. You climb to a platform next to a National Coastwatch Tower and play a downhill par 3 from a driving range mat to the other side of the peninsula, right over the 13th to a green set in front of the cliffs. Sheer madness. The other holes coming in offer a combination of blind shots and cliff top holes other than the final hole that takes you back to the clubhouse. The 8th/17th is probably the best of the closing holes as you skirt alongside the cliff edge for 350 of the 500 yards of this par 5 that again has a wonderful setting, but could arguably benefit from some better shaping and bunkering, something that could be said for a selection of holes on the course. So, a course that was central to a “Visit Wales” commercial a few years back and in a review where I’ve mentioned Old Head, Pebble Beach and Turnberry, how does it rank? These are all weighty comparisons, and Nefyn definitely has its extreme high points that warrant these comparisons; the course is absolutely spectacular with some jaw dropping views and these facts alone make the course a must play, but for many, once will be enough. Having not played here before, the location of the next tee and in some cases, the location of the fairways is confusing to say the least. That being said, I’m not too far from giving the course a 5-ball rating but I’m holding back because whilst golf at Nefyn is mental, and I love mental, maybe this place is a bit too far off the spectrum. Purely on the basis of location, Nefyn has the potential to be one of the best courses in Britain, but it would need some Trump-esque funding and a brilliant course architect to get it to warrant that sort of lofty position. Whilst in its current state, the course falls considerably short of best in class status, I have to make the point that I paid a mere £24 to play the course at the 5pm twilight rate, and that readers, is an absolute bargain. Revisited Nefyn this Summer as part of a Society tour to NW Wales, Carnarvon was a great base. Loved Nefyn on my previous visits and was excited to see the changes. We had a great time, and the newcomers were blown away by the location, but the (entirely understandable) changes to the Point holes have traded excitement for the safety of grockles obliviously sauntering through a firing range. The new holes are still a little raw and will I'm sure settle down, but something of the magic has been lost. Still good fun though, and a great pint at the Ty Coch - not nipping down the hill to the beach should be a DQ ! Playing Nefyn was great fun. It has three distinct sets of nine holes: a front nine with many holes alongside the clifftop, a new back nine set slightly inland but still with plenty of sea views, and an old back nine which plays out and back along the peninsula, "the point", and for which the course is best known. 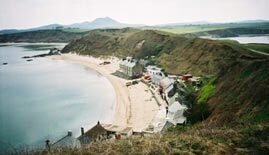 Due to its location I think Nefyn sits outside normal classification. If you're looking for USGA standard greens, green fees of several hundred pounds, and a chance to bang your third newest driver of the month 300 yds then the point may not be for you. If however you treasure golfing history, and enjoy challenging your accuracy along a stretch of land where its barely believable someone once had the audacity to build some golf holes then Nefyn is worth a visit. Frankly three balls (average) is mean and neglects the location. Four I can understand. I'm giving it a five because as I say I think it is an exception and the backdrop is stunning. Nefyn was our northern most excursion on our Wales trip. You will be drawn by playing the Old back nine. But much of the front nine is better than the Old back. If you go to experience this wonderful course do so mid week. Playing the Old on a weekend whilst alarmingly ignorant tourists rummage about the limited land is disconcerting. Finally at the 18th while a family group of 10 came sauntering down the road adjacent to the short par 4 fairway…I fired one right at them. It missed by all of 10 feet and they reacted like “where did that come from” It’s a golf course. The Old 9 is a bit tacky…But it is worthy of a trip. Take precise measurement of your 2nd shot on 10…As the course markers are totally messed up. Glad I played here. Probably won’t again. Note - the holes out on the peninsula are currently under reconstruction and are not in play following the severe winter we've just had.We had to play the new course (although we were allowed to play 4 of the Old course to practice beforehand) and we all enjoyed the course and the facilities. It was fairly windy but the sun was shining and the course was in great condition. Not overly long, and a fair test of golf. Would like to try the peninsula holes when they re-open if we're ever out this way again. Just wanted to add that the clubhouse was friendly and the green fee was great value, as it should be, when you drive 2 1/2 hours to get there which is what many people who play Nefyn will be doing. Royal St Davids take note ! I played Nefyn on a pleasant Sunday afternoon. The first holes were interesting going out along the coast but the second half of the front 10 were less memorable. Not a problem though as the last 8 holes were The Old Course out on the peninsula the part we were all looking forward to. Unfortunately it turned out to be a bit of a disappointment. The good weather had brought out many walkers and the paths were too close for comfort. We were unable to drive on the narrow Par 5 17th as there was a constant stream of families coming over the brow of the hill along the side of the fairway. We enjoyed the 13th with a drive over a rugged inlet and the Par 3 14th alongside the Lighthouse at the end of the peninsula where you could play with no children nearby. Otherwise we found there wasn’t sufficient space on the headland to play golf and allow walkers . The Clubhouse was fine serving good food with courteous staff. We were told the members play the New Course, when Health & Safety reaches North West Wales that maybe the only option for everyone.